Happy Valentine’s Day!!! We had our celebration a day early and while grocery shopping I came across frozen Lobster Claws. I bought them thinking I could just Google directions on how to serve them. No luck. If you see them, buy them. They are so yummy and here’s how to prepare them. It took me two tries to perfect this. …then drink Shakeology for breakfast the next 7 days :). p.s. 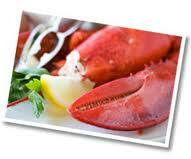 Where to buy lobster claws? Most grocery stores have them in the frozen section. I found mine and Costco. They have them with the frozen seafood, but if you’re lucky, you’ll find some that they have already thawed in the refrigerated seafood section. Less time for you and they cost less, added bonus!